Since 1974, the Wolverine Tube factory cranked out copper tubing for industry and construction use from its Shawnee, OK plant. Last year, the Canadian owners decided to sell the factory, threatening more than 500 Shawnee jobs. Greg Gallman, the plant’s general manager, worked with local investors and bankers, the city’s Economic Redevelopment Foundation and MB Business Capital to save the business and renamed it Shawnee Tubing Solutions. Sometimes a business deal is more than just a transaction. The fate of more than 500 workers at the Wolverine Tube plant in Shawnee, OK hinged on completing a loan that could save their jobs or close the factory. Although the story has a fairytale ending, the race to the finish line had more ups and downs than a roller coaster. Only an all-out sprint by MB Business Capital, the Shawnee business community and Greg Gallman — president and CEO of what is now Shawnee Tubing Solutions — kept the plant from shuttering. The town of Shawnee, located about 40 miles east of Oklahoma City, once rivaled the state’s capital for prominence in the state. After the Civil War, Eastern settlers and European transplants poured into Oklahoma. At first, large swaths of Oklahoma lands were set aside for the Fox, Sac, Shawnee and Kickapoo tribes, but pressure on the U.S. government grew too strong. The Land Rush of 1889 opened up the unassigned territories to white settlers. Six years later, on July 4, 1895, the city of Shawnee was founded. The early years of the new century were boom years for Shawnee. Ranchers drove their cattle across the plains to reach the railroads. Located in the heart of cotton, potato and peach country, the town thrived as an agricultural center and a railroad hub. By 1902, there were seven cotton gins in the immediate area and two cotton compresses. Between March 1901 and March 1902, 375 railroad cars of cotton product were shipped out of Shawnee, along with 150,000 bales of cotton. Feed stores, wagon yards, an overall factory and an assortment of other businesses designed to serve the farmers as they brought their crops to market arose in Shawnee. In 1903 and 1904 the Atchison, Topeka and Santa Fe Railway and Missouri, Kansas and Texas Railway extended service to town. The railroads were not only vital for transport; they were among the town’s leading employers. But as the railroads lost their powerful hold on commerce, and the agriculture and cattle industries changed, Shawnee no longer challenged the big cities. By 2014, Shawnee’s population hovered around 31,000. Today, Shawnee’s largest employers are three tribe-owned casinos. The town serves as headquarters for the Sonic drive-in chain. And since 1974, Wolverine Tubing provided jobs for more than 500 Shawnee residents. Wolverine was founded in 1916 in Michigan and enjoyed initial success providing parts for the booming automotive industry. Although the company suffered a downturn during the Great Depression, its fortunes revived with the U.S. entry into World War II and continued through the post-war boom. Over the years, the company expanded, adding plants in Oklahoma, Tennessee, Alabama, London, Ontario and eventually moved its headquarters from Michigan to Alabama. In 2008, a group of Canadian investors purchased the London facility and changed the name to Great Lakes Copper. The U.S.-based plants retained the Wolverine name. According to Gallman, the Canadian investors had no ties to the Oklahoma community. But it was still a shock when members of the company’s board of directors approached Gallman last summer and told him they would be selling the Oklahoma and Alabama plants. For Gallman, the news was especially devastating. 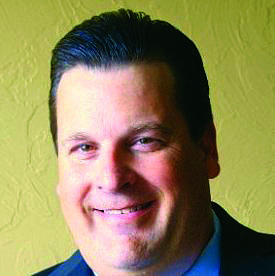 In addition to serving as CFO for Wolverine, he was a member of Shawnee’s economic development committee, charged with bringing business into the community. Over the years, Gallman had developed a relationship with Great Lakes Copper CEO Jean Noelting, who offered him first right of refusal to purchase the plant before putting it on the market. Gallman was galvanized into action by the possibility of keeping the factory alive, and he immediately began trying to raise the financing to complete the transaction. Gallman consulted with Tim Burg, executive director of the Shawnee Economic Redevelopment Foundation, who agreed that keeping the plant open was a top priority. They also wanted to keep the financing local, but this proved to be a daunting task. “Even [if] all the local banks came together, this was a project too big for the Shawnee bankers,” Gallman recalls. Last summer, the pair approached WayPoint Capital Partners, a family office-affiliated private equity firm, to help find a lender and equity partners. It was an eye-opening experience. So Gallman renewed his efforts to raise the funds in Shawnee, and he enjoyed some success. He found 18 residents who were willing to invest in the company. “We had lawyers, bank presidents, optometrists — they all rallied behind us to keep the jobs here,” Gallman recalls. But still, it was not enough to purchase the plant. They also started looking for lenders that could provide an asset-based loan, an ideal choice for a company like Shawnee with heavy machinery and a valuable product. To Gallman, MB also felt more like a local business, since it was based in Chicago with strong Midwestern roots. Gallman was born and raised in Chicago, although he is now one of Shawnee’s strongest boosters. John Curtis, MB group president for the Southwest region is based in Oklahoma City. Like MB, New York-headquartered WayPoint has an outpost in Tulsa, OK, and Curtis had worked with Waypoint’s Jim Holder on many transactions over the years. MB was approached in October 2016 and submitted a proposal in November. But in January 2017 the unexpected happened. “The rug was pulled out from under me,” Gallman recalls. Noelting called to say another offer had come in, and he was not going to close the deal with the group in Shawnee. It was a blow to Gallman and his team, who had worked so hard to put together the financing, but they had no options. It was Noelting’s company. A month later, Gallman’s phone rang again. The deal with the other buyer had not panned out. Noelting was prepared to sell the plant to Gallman, but he only had 45 days to put the deal together because Noelting needed the money to pay for another venture. The local investors were still on board, but Gallman had to ask MB to provide the debt financing. “They took us on, and there were no hard feelings over the stopping and starting. They believed in us, and they delivered,” Gallman adds. Since MB had already completed part of the due diligence a few months earlier, the team only had to do a bit more and go through the credit approval process. The transaction closed April 28, 2017. Part of the company was sold to a German buyer, which added another complication to the mix. “We all had to close at the same time,” Gellman says. In the end, MB provided a $1.8 million term loan to buy equipment and a $33 million revolving line of credit. The company has dropped the Wolverine name and emerged as Shawnee Tubing Solutions. The company is also dropping its technical tubing line, which Gellman says is mainly produced in China and is too labor intensive to manufacture, and re-introducing water tubing while expanding into new markets. Gallman is proud of the 18 Shawnee community members who invested in the company and the five local banks that purchased the building and rented it back to the company. For Gallman and his Shawnee partners, this was more than a business deal that saved 500 jobs — although that was of vital importance. Saving the factory was a victory for the entire Shawnee community.